I’ve been cooking Thanksgiving dinner for the past 15 years – no joke. The year we moved to Charlotte was the first year I hosted, and it’s a time I look forward to each year. Though it’s hectic and requires a lot of work, I absolutely love it. Things have changed over time. In prior years, I made the famous standard green bean casserole. You know, the one that uses highly processed cream of mushroom soup – from a can. I used cupfuls of sugar in pumpkin bread, and I also used low-fat butter in cooking. I’ve certainly changed my cooking ways in the past 15 years, and I’ve also added and subtracted some recipes from my lineup. There are the tried-and-true recipes that you’ll see on my Thanksgiving table each year, but there are usually one or two new ones that make their debut each year as well, including the one I’d like to share with you today. I started making these Sweet Potato Biscuits over a year ago. I didn’t initially make them for Thanksgiving. I made them because I thought they were a good way to get some more vegetables into my kids’ diets. I certainly don’t hide vegetables in their food, but I’m all about adding in an extra serving here and there. So while I hope you’ll consider adding these as a new addition to your holiday lineup, I encourage you to make them any time of year. My kids just about fight to get the last one of these, and my husband and I also enjoy the flavors. Oh, and I didn’t mention, they are a great addition to the lunch box too! As you prepare for Thanksgiving and other upcoming holidays, I encourage you to consider adding Traditional Medicinals to your shopping list. I love that their teas are all organic, and I also love the values the company holds. Their herbs are all pharmacopoeial grade, and their passion for delivering a sound product is contagious. Their Ginger Aid would make a wonderful start to your dinner, but it is also ideal for drinking after any overindulging – and who doesn’t do that at Thanksgiving? :) You can find their teas online as well as at Target, Whole Foods Market, and so many more locations. How has your Thanksgiving menu changed over the years? Cook sweet potatoes by roasting for 45-55 minutes or until soft. You can also cook them by microwaving for about 10 minutes, until soft. If you microwave your potatoes, be sure to still preheat your oven. Peel the potatoes and process them in a food processor until smooth. Leave 1 cup of the processed sweet potatoes in the processor and remove the rest for another use. Whisk together the flour, baking powder, salt, and cinnamon in a medium bowl. Add to processor and pulse until it begins to bind. Add butter to food processor and pulse for 30 seconds. Add milk and pulse until dough is moist. Dust a piece of parchment paper with flour. Place dough on top and add another sprinkle of flour. Add more flour as needed to avoid stickiness. Roll dough to about 3/4 inch thickness. Cut shapes with fun cookie cutters or simply use a glass to cut circles for biscuits. Re-roll scraps and cut until all dough is used. 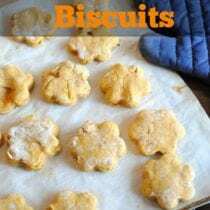 Place biscuits on a parchment-lined baking sheet. Bake for 15 minutes or until golden brown. These sound delicious! Do you think you could substitute the whole wheat flour for almond flour? Hmmm … I honestly don’t know about almond flour, but I did use a GF 1:1 replacement flour to make them for one of my girls who is GF. HTH! I would like to know the same thing or gf flour? I used a 1:1 GF replacement flour in them and it worked great. Would pumpkin or butternut squash work in place of the sweet potatoes? I would think that it would, but I have not tried it. Please let us know if you try it! I made them with pumpkin and they were fantastic! These look amazing. 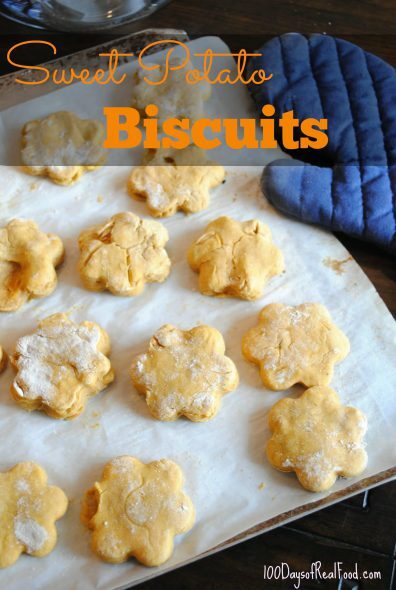 About how many biscuits does this recipe make? My girls LOVE sweet potato biscuits as well!. They especially love taking the leftovers in their lunch. I am not a vegetable sneaker either, but love the added veggies over plain biscuits. Would steaming the potatoes be ok or would we be missing out on some flavor from roasting? I honestly don’t know since I haven’t tried it… But I’m assuming it would be OK! Please let us know if you try it. So there is only 1 C of sweet potatoes in these biscuits? Just want to make sure I am reading this recipe correctly. That’s correct – 1 cup. wow this is interesting i will try them on Friday my child’s love biscuits and this one is healthy. thanks for wonderful recipe. Can you make the dough the day before and refrigerate until you’re ready to bake? Hi there. Kiran answered another reader this way: I honestly haven’t done that. The key would be to keep the dough cold so that the butter remains cold until baking. Hth! Typically any dough made with baking powder will not work if made ahead – the baking powder activates when it’s mixed with liquid and will release all of its rising power well before you are ready to bake the next day. If you want to start it a day ahead, premix the dry ingredients and the wet ingredients separately, then mix them together and bake just before you need them. Can you make the dough ahead of time (today) and then cook later (tomorrow)? I honestly haven’t done that. The key would be to keep the dough cold so that the butter remains cold until baking. Hth! Kiran- I’m curious about what brand of gluten free flour you use? Allison – I use Bob’s Red Mill 1:1 Gluten Free Replacement Flour. One of my kids is GF so I use it in many recipes and she really likes the results! excellent recipe! i will try it for my little one. he will surely love it. can i preserve it in refrigerator? These were delicious! I made them with some roasted squash I had in the freezer and added a tablespoon of maple syrup. My 2 year old and 4 year old kept asking for more. Super easy, thanks for a great recipe! Thanks so much for commenting. I’m so glad that you enjoyed them! These sound great. The recepie calls for two sweet potatoes, and then says “leave one cup and remove the rest for another use”. Confused – so the recipie should call for one cup pureed sweet potatoe? That is correct. You need 1 cup pureed; if you try to just puree that little amount in your food processor, it’s a bit difficult – so a larger quantity when pureeing makes it easier, if that makes sense. Looks like a Paleo-licious snack … will try to make it this week! Thanks Kiran for such an awesome recipe. I have never tried for biscuits. Want to try for first time. Hope it will be liked by my 4-year old Emma. Though I have not tried it, I don’t see why it wouldn’t work. Has anyone tried these using an all purpose gluten free flour blend? I made it with a 1:1 GF flour and it works fine! Just made these and they’re delicious! The sweet potato flavor is mild, so even if you don’t like sweet potatoes, I think you might like these. I don’t have a food processor, so I mixed the dry ingredients, added grated, frozen butter, then added the sweet potato (I mashed it in a bowl with a fork) and milk and stirred it with a spoon until it formed a dough. Great to know that it works without the food processor. Even if you do have one, it’s a lot less cleanup to make it in one bowl. Oh, and I’m glad that you liked them, too! 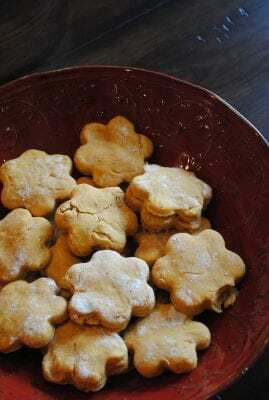 For us, these were just ok. My 3.5 year old ate THREE the evening we made them, so I thought they would be a big hit, but then, no matter how I reheated them, he would never eat another one. My husband liked them ok; I didn’t care for them. Love this blog – just leaving an honest review of this particular recipe. Honesty is fine! They are definitely best the day that you make them, but my kids never have an issue having them a day or two after. Thanks for trying them. I will have to agree with Marlana, though perhaps my baking powder was too old. The biscuits didn’t rise and were extremely dry and tasteless. **I didn’t slather them with butter or jam, as I have to watch my calorie intake. After reading the previous reviews I was a little wary about making these scones, however they turned out perfect for my first attempt (with bonus points for being a healthy, guilt free snack for my 14 month old). Thank you for the recipe!! Glad that you liked them!! My kids especially love them, too. Is there a way to make without the food processor? I don’t own one…any ideas on a good basic not too pricey model? If you read the prior comments, Anna says she made them without a food processor. Her comment was on page 2 .. HTH! They look not hard so much to make this biscuits. I will try to make my own one and hope my kids will love them. Thank you so much ! These were ok! Maybe I needed to add more flour because they turned out a bit doughy and chewy.. not like a biscuit. Any tips?? Hi Sara. Was your baking powder fresh? They are not quite as fluffy as traditional biscuits. I made it today and a big plate of it went fast with my kids! Great stuff, thanks! I like biscuit but I not like potato so much. But I will try this recipe. Hope it good ! This is a great recipe. It looks very delicious. I will try it soon. Thank you ! You help me escape my problem because my kids hate eating vegetable. However Now i think my kids will love this pecuilar dish.Thanks for your share. I don’t have a food processer. Will something else work? These sound wonderful but I have no intention of buying a food processer. Hi there. Sure, you can just mix these up by hand. Thanks Sarah! Hope you enjoy them:).